Christmas is a couple of days away and the holiday cheer is all around us. People all over the world are excited because it’s the most wonderful time of the year! One of the best things about Christmas is the scrumptious Christmas breakfast that you enjoy with your family and friends. It’s a beautiful experience to prepare breakfast for your loved ones, especially for your little munchkins. A fun Christmas breakfast is something every child looks forward to, so why not make it even more interesting for them? 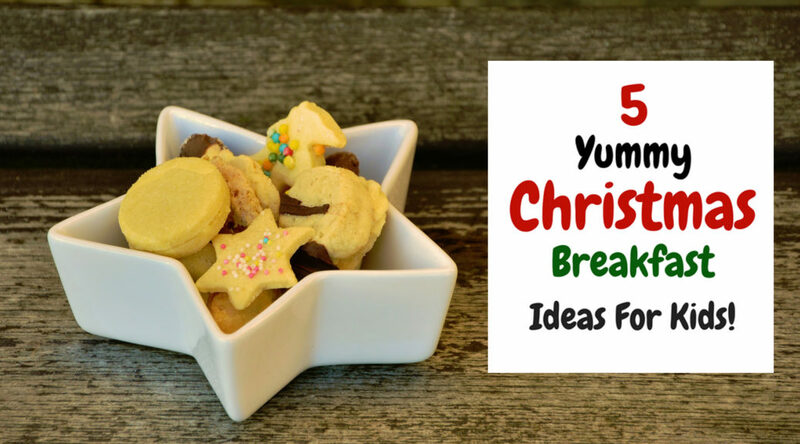 Below are 5 easy and creative ways to make Christmas breakfast that will make Christmas even more magical for them. – Make a plain pancake with your usual recipe. Here’s one simple recipe from allrecipes.com. – Place a pancake on a plate. Add strawberries to make the Santa hat. – Slice a strawberry to make Santa’s nose and place it in the middle of the pancake. – Pipe whipped cream onto the pancake to make Santa’s beard. Also add a little whipped cream at the end of his hat. – Place two berries to make Santa’s eyes. – Finally, make him smile with some chocolate sauce and you’re done! 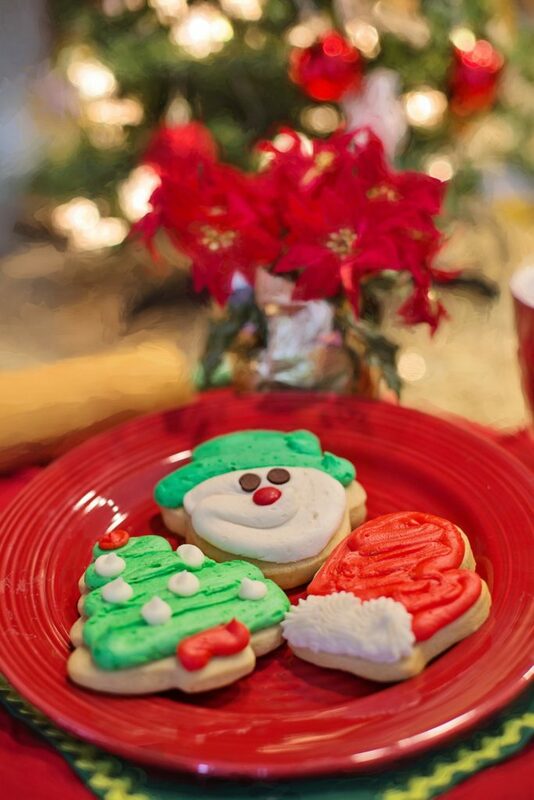 – Christmas tree cookies can be made by first making your regular cookie dough. Here’s a detailed recipe. – Once the cookies are baked in the shape of a Christmas tree, make sure you let them cool completely. – Then, pipe green colored frosting on the cookies. – That’s pretty much it. You can also add a star shaped candy on top of your very own Christmas tree. Enjoy! Some more ideas for cookies! – If you love baking, making brownies will be very easy for you. To make Christmas special reindeer brownies, follow this recipe to make the basic brownies first. – Once they’re made, cut up your brownies in triangles to make the faces of the reindeer. – Place some brown candies to make the eyes of the reindeer. – Draw a smiley face with some whipping cream. – Finally, add some pretzels to make their antlers. Reindeer brownies are ready! -Waffles might be a staple breakfast food in your home, but how do you make Christmas themed waffles? It’s simple! 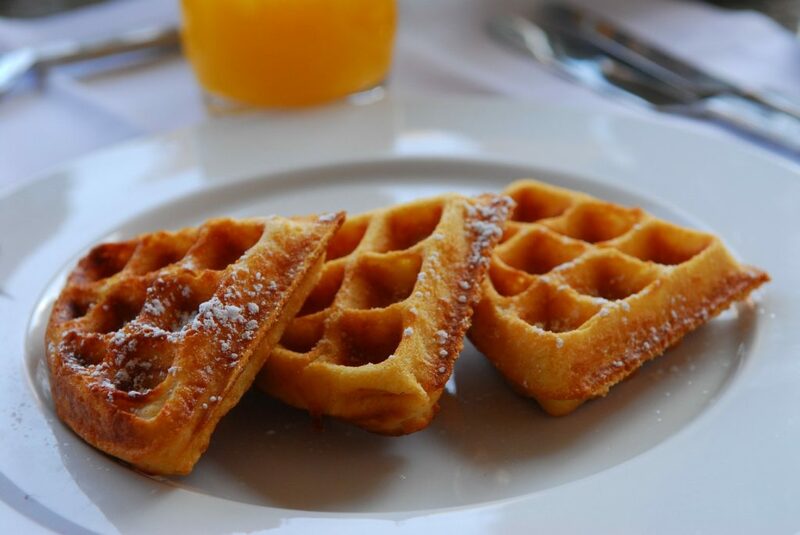 -First, prepare your waffles (here’s a recipe if you need any help!). If you want to make it even more accurate, add a bit of green food coloring in it. -Next, cut the waffles into triangles. -Place these triangles under each other to look like a Christmas tree. -Add some sprinkles on it. -Your Christmas special waffles are ready! -This one is simple and easy! First, bake some green cupcakes. Yes, green! Here’s a great recipe. 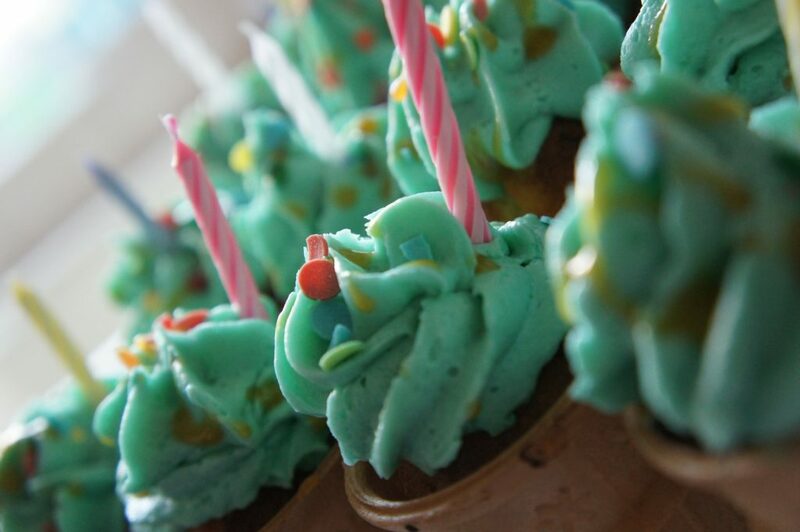 – After the cupcakes have cooled, pipe some green colored cream cheese frosting on top. – Again, add some sprinkles for that extra Christmassy look. – Place a tiny star shaped candy on top of it. It’s done! Preparing and having your Christmas breakfast with your friends and family is a wonderful experience. These festive desserts will surely make your Christmas day even sweeter. 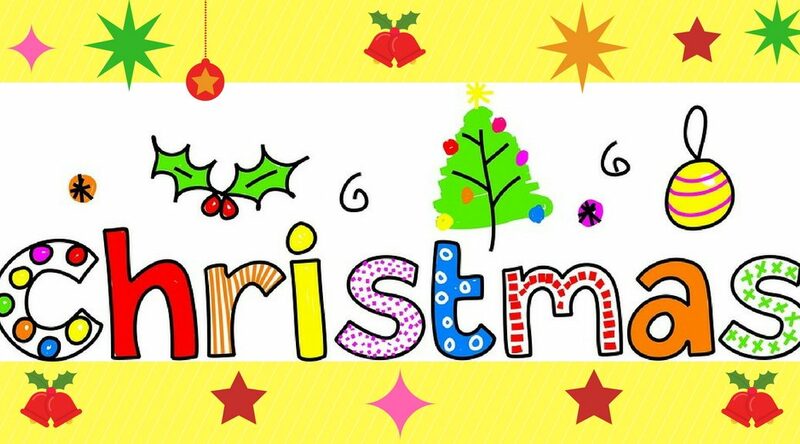 For more Christmas games, activities, songs and stories, you can download the KidloLand app here! Merry Christmas! It’s December already and that means, 2017 is almost coming to an end. But, it also means that Christmas is near! It is that time of the year when parents and children of all ages rejoice and make merry together. Surprise gifts, delicious food, decorations, stuffed stockings are all Christmas essentials that little children mainly look forward to. Your little one is probably very excited to know about Santa’s gift for him/her this year. 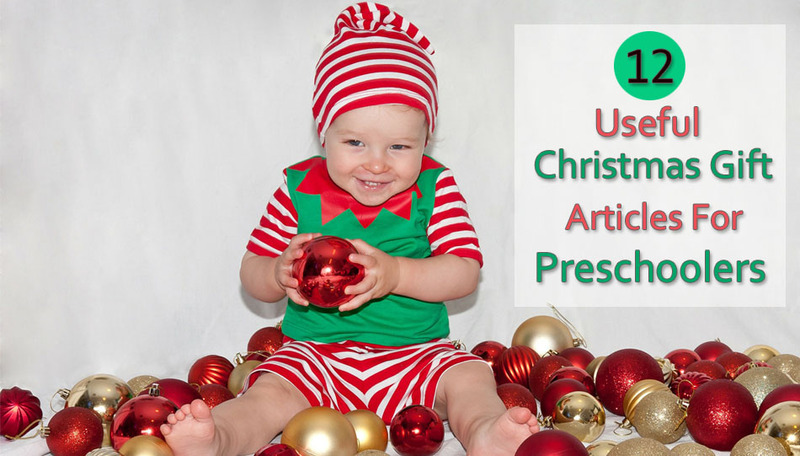 If you wish to make Christmas a memorable one for your toddler or preschooler, look no further. Here are 12 Secret Santa gift ideas that your little bundle of joy will absolutely love! 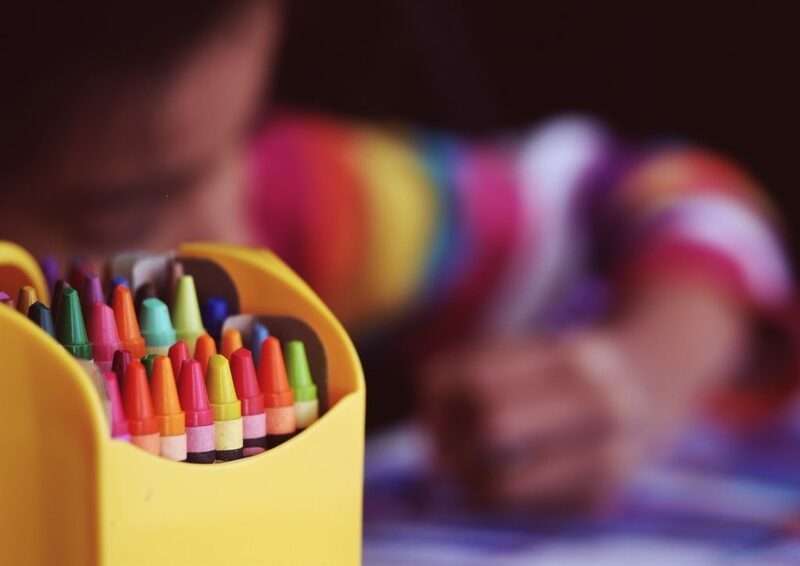 Encourage your children’s creative side by gifting them packets of crayons, colored pencils, and markers. These gift articles are guaranteed to motivate your children to draw and express themselves very well. If your children have dolls that they absolutely adore, take it up a notch by gifting them their dolls’ clothes. They will be elated to find out that their favorite doll has brand new clothes for Christmas too! Apart from making play time fun for young kids, playdough can also speed up their fine motor development, since it involves activities like pushing the clay in, pulling it out, squeezing it, rolling it and much more. Printables are a great way for kids to develop their coloring skills. It’s a fun method to increase their hand-eye coordination, develop concentration and focus, identify colors, which in turn enhances their overall growth. 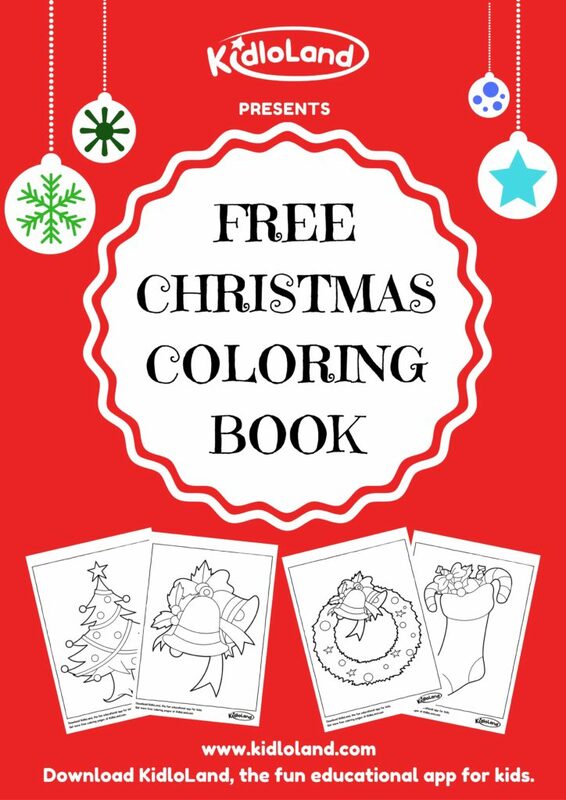 KidloLand has 200+ worksheets that your child can color to his heart’s content. 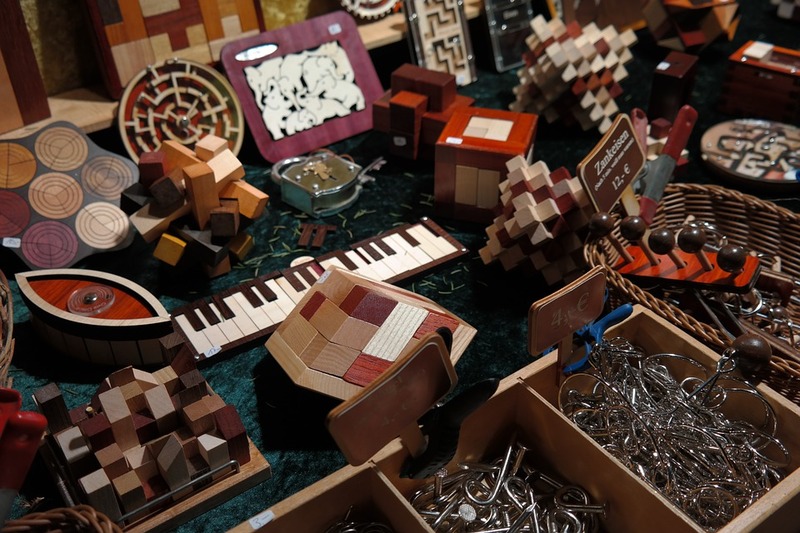 Simple and easy jigsaw puzzles are known to develop a growing child’s cognitive skills, hand and eye coordination, problem-solving skills and they also learn to work with a goal. It can be an important addition to your child’s early learning experience. This Christmas, make sure you download the KidloLand app in your iPad for your little one. Filled with 1000+ wonderful interactive animations, nursery rhymes, songs, games, activities and surprises, this app is sure to delight, engage and educate your toddler and preschooler. Board books are small books with thick pages made of paperboard which can handle your child’s inquisitive little fingers. Find good board books that tell simple but brilliant stories that your toddler will enjoy reading and appreciate. Different types of toys are a necessity for the development of every toddler and preschooler. By playing with toys, they learn to explore, figure out and interact with objects from an early age. 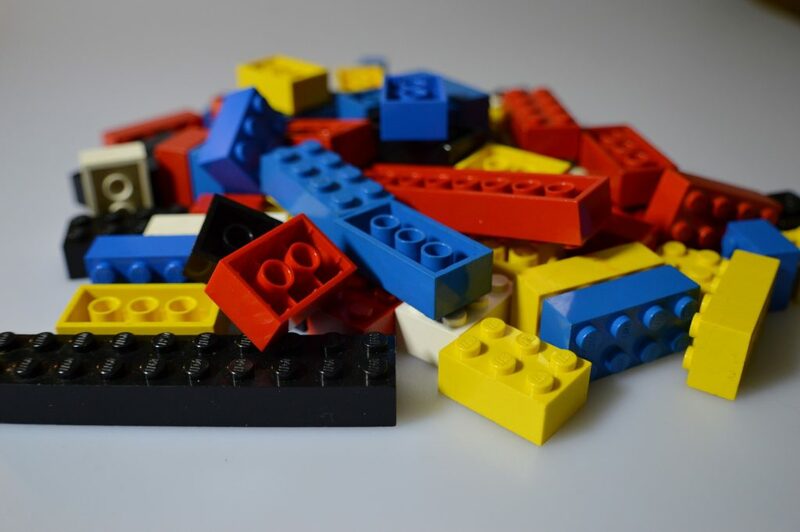 Trucks, LEGO, cars, action figures, are all great gifts that your preschooler is sure to love! 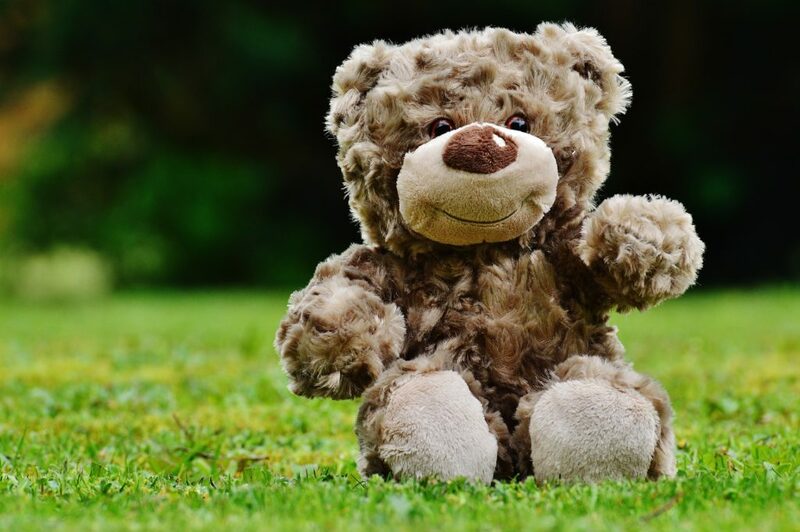 Cute plushies or stuffed toys can be great companions for your kids to hug whenever they’re worried or anxious about something. 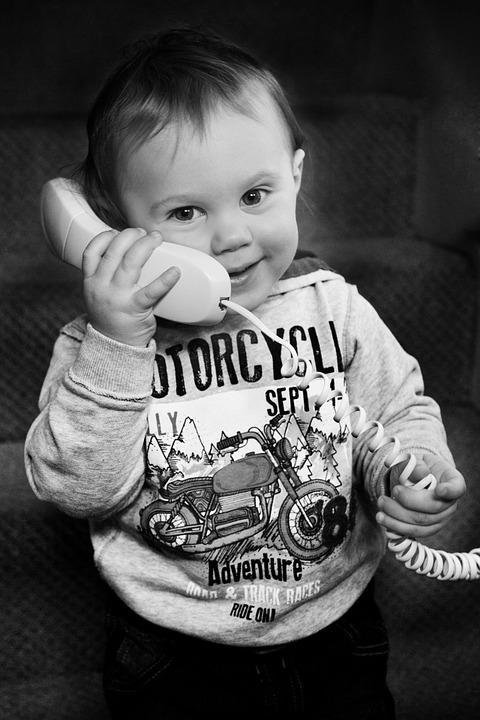 Soft toys can also help your toddler to enhance his creative thinking skills and encourage imaginative play. Children will learn to love their stuffed toy and care for them just like they would care for a friend. Another great option for a secret Santa gift is a pack of stickers and a drawing book for your child to doodle on. By using stickers, your child can personalize and decorate various objects that belong to them, learn about positioning, and develop his hand strength. If your child is a crafty little one, then this is a perfect gift from ‘Santa’. Find a craft kit that has activities like jewelry making, building blocks, paper craft, DIY projects which will spark off your baby’s imaginative skills. Remember to always supervise your children when they play with small objects. Bath time can be fun with the addition of some bath toys. Bath toys are affordable and can easily ensure that your child looks forward to bath time. Apart from the floating yellow duck, you can buy some floating boats, floating animals or other squeaky toys to make bathing enjoyable for your baby. 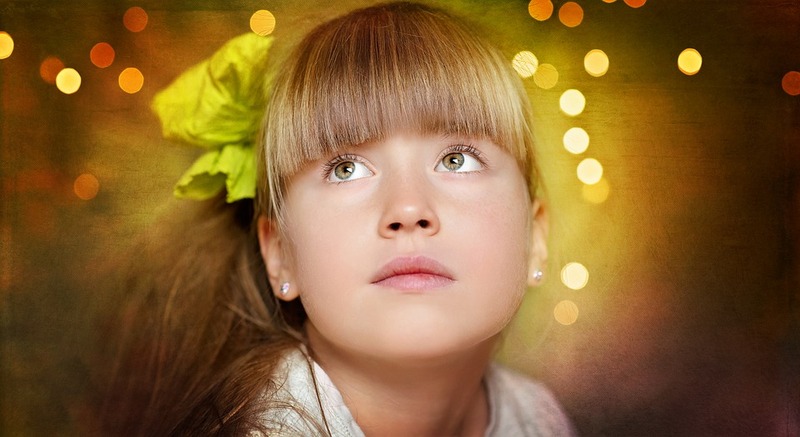 Christmas gifts can be useful, practical and beneficial for your child if you choose them well. 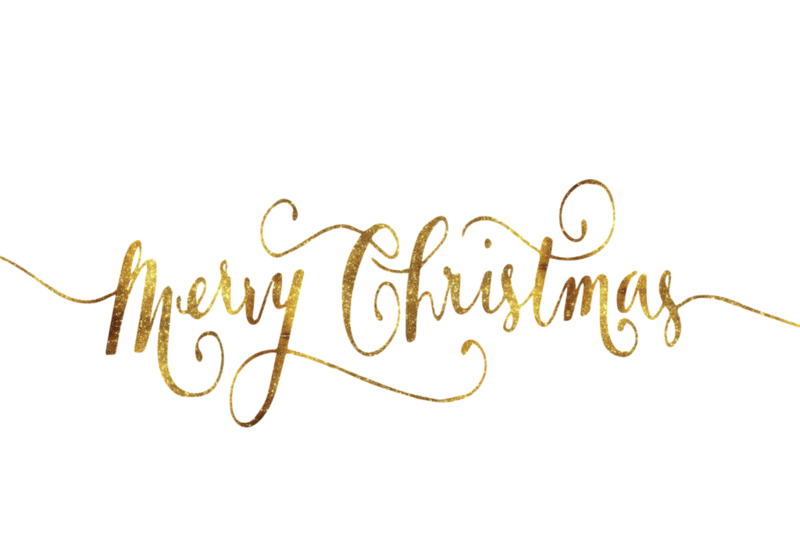 Select any of the gift ideas mentioned above and have a joyful Christmas! It’s mid-November already and Thanksgiving is near! What better way to celebrate it, than with awesome Thanksgiving craft? 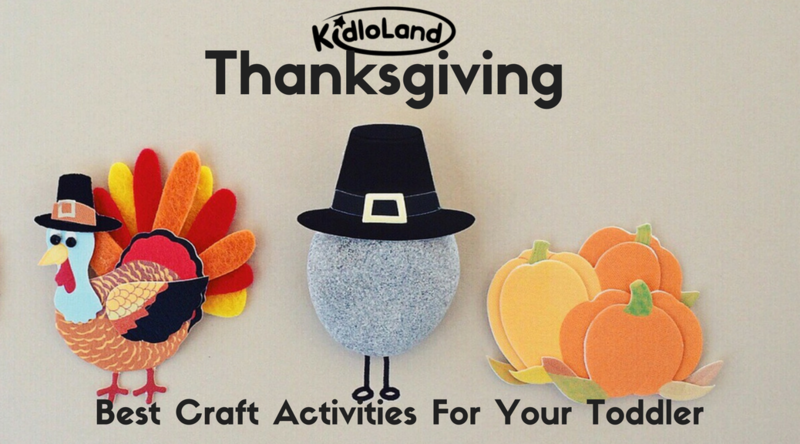 Make this holiday memorable for your toddler by engaging in Thanksgiving themed craft activities together and adorning your house with your little one’s creations. Thanksgiving was originally celebrated as a day of giving thanks for the blessing of the harvest, but soon it also became a way to be vocal about the things and people in your life you are thankful for! 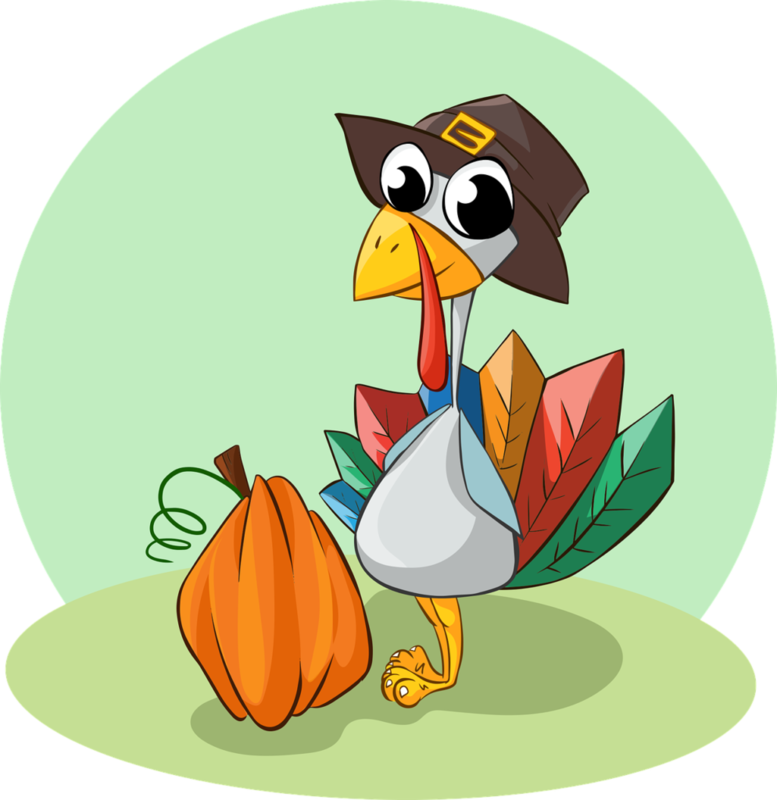 In the spirit of Thanksgiving, here are 5 simple and creative Thanksgiving craft ideas that you and your kids can easily do together! Carefully cut out a simple circle or the outline of the number 8 on a brown paper. This will be the body of your turkey. Stick googly eyes or draw them on with a marker. Cut out a small triangle from a paper for the turkey’s beak. Stick a small red piece of paper for the snood of the turkey. After that, you need to cut out leaf-shaped pieces out of papers of different colors. Stick the pieces next to each other and then, they should look like the feathers of a turkey! Finally, glue the body of the turkey to the ‘feathers’ you just made. Ask your preschooler to write one thing he’s thankful for on each of the ‘feathers’ and then it’s done! 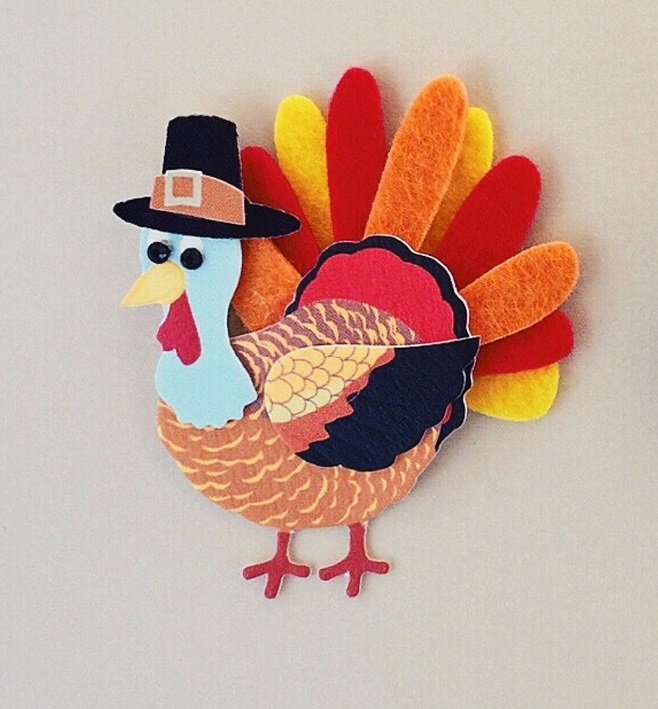 You have your very own cute little thanksgiving paper turkey. First, cut out a paper plate in half. Paint all over the plate in any shade of brown! Glue the circular sides of both the halves together. Keep the straight side as it is. This will be your paper hat. To decorate it, stick a pair of funny-looking eyes, a beak and a snood, all cut from paper, on one side of the paper hat to make it look like a turkey. Get some colorful feathers which you can find from any craft shop. Stick the ends of the feathers to the back of the paper hat. That’s all! Your happy little toddler can wear this turkey paper hat all day to celebrate Thanksgiving! 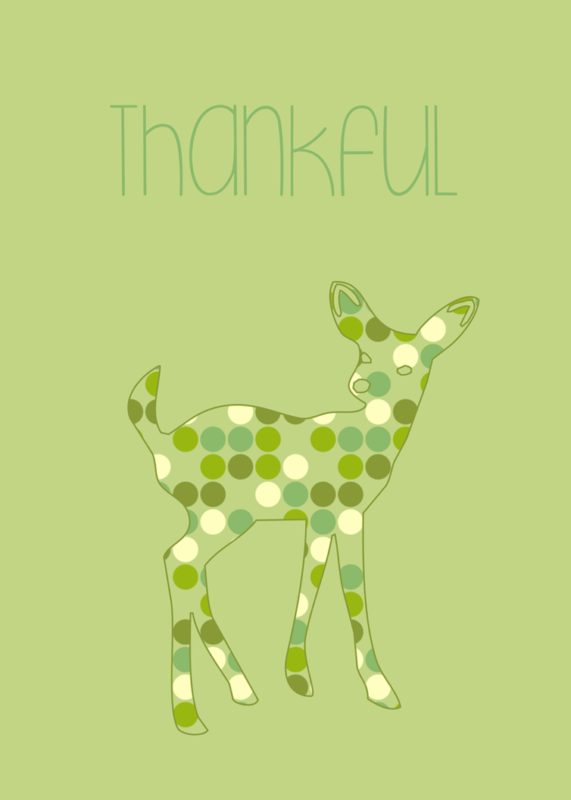 A greeting card is a great way to show how thankful you are for all of the things that you’re blessed with. On a piece of white paper, you can paint the trunk and branches of a tree with brown or black paint. Ask your child to dip his finger in paint (make sure you’re around when he does this!) and stamp on the paper. Once it is done, your tree will be complete. Write down all the things that your child is thankful for next to the fingerprints once they’ve dried up. Your hand-made Thanksgiving greeting card is ready! Thanksgiving is incomplete without any food! Here’s a wonderful edible craft idea for Thanksgiving. You will need one big circular waffle and one small circular waffle. This will be the cute body and face of the turkey! Place the small circular waffle on top of the big waffle. Cut out small circles out of some chocolate, and place them on the small waffle as the ‘eyes’ of the turkey. A triangular piece of fruit will serve as its beak. Next, cut two triangle shapes out of a new waffle. These are the turkey’s wings. 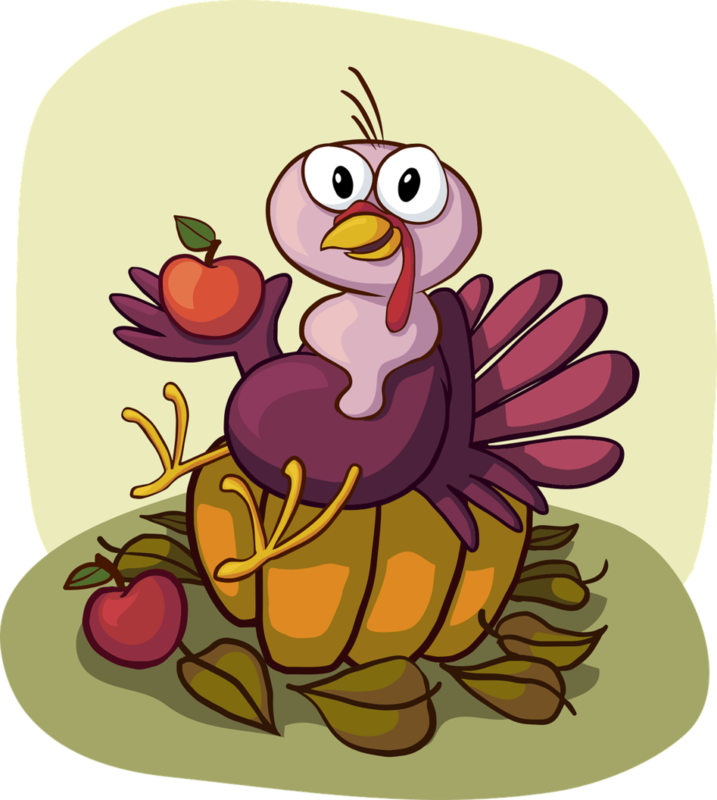 The final step is to cut various fruits in triangular shapes and position them as the turkey’s feathers. And it’s done! Ask your child to dip his palm into some paint and print it on a paper. Now gather some fall leaves and paint them in crazy colors. Stick them around your little one’s hand print. Draw a pair of eyes, beak and a snood to give it the full turkey look! Your creative little hand print turkey is ready! 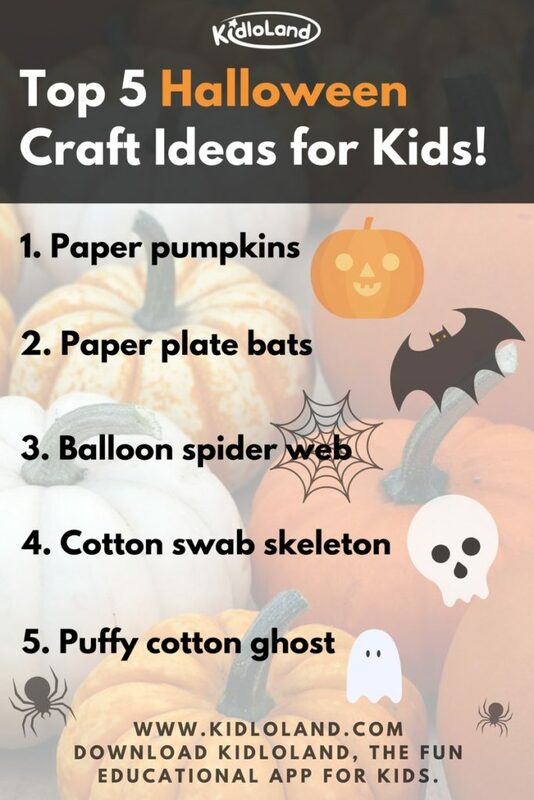 Get crafty on Halloween with your little ones! Halloween is the perfect time to get your creative juices flowing. Create, fold, wrap, paint and go crazy! Little kids absolutely love crafting new things. You can take it up a notch by setting a Halloween theme to your crafting activities. 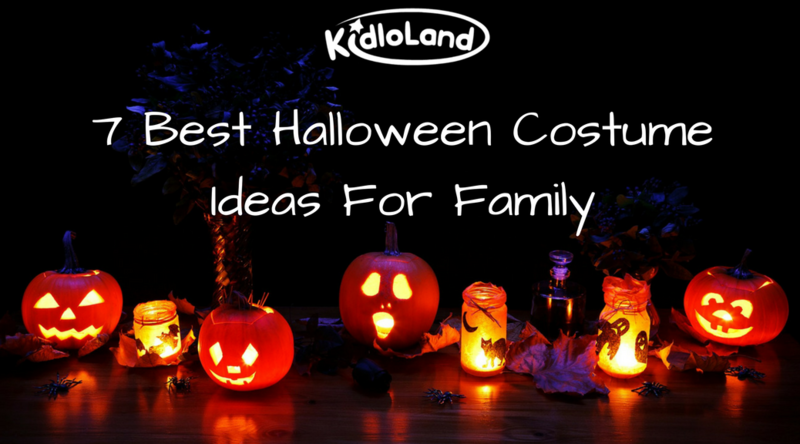 Pumpkin shaped lights, skeletons, spooky wall hangings – the ideas are endless! 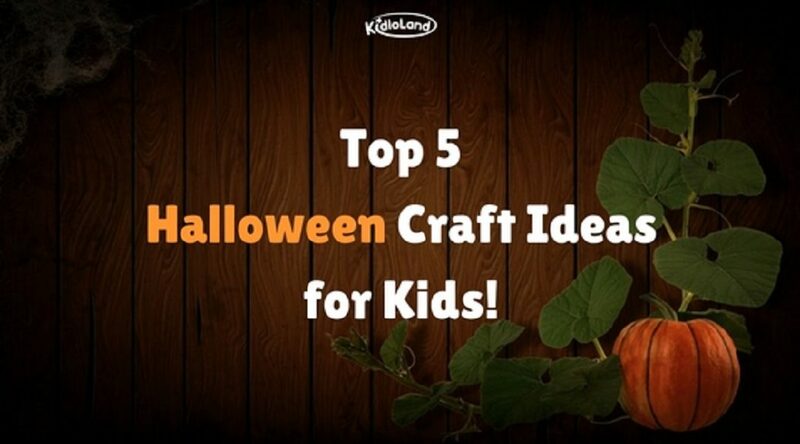 If you’re looking for some fun and innovative craft activities to do with your children, here are the top 5 Halloween craft ideas that you can easily do! Take an ice-cream stick and paint it orange. Cut 6 vertical strips (carefully!) from an orange craft paper. Every vertical strip should have one more strip of the same exact length. Make sure that the length of the strips is more than the length of the ice-cream stick. Stick the ends of the strips to the ends of the ice cream stick. Cut two small green strips for the stem and bend them upwards. 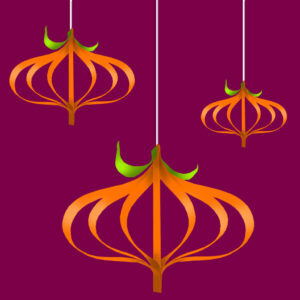 Hang the pumpkin with a thread! That’s it! Hang a few pumpkins of different sizes to get crafty this Halloween! Trace a bat wing template onto your black paper using a pen or pencil. Then flip the wing template over and trace it again. Cut out the bat wings. Using tape, attach the bat wings onto the paper plate. Using the glue stick, attach googly eyes to the front of your bat and draw on a small mouth with a white paint pen. Start by cutting out a ghost template. Glue cotton balls on it until the ghost is completely covered. If you want, you can add a string to the back and hang your ghosts up somewhere in your house. Blow a balloon. Tie a knot and attach a yarn thread around the knot. Mix glue and water in a bowl. Add threads of yarn into the mixture. After 5 mins, deflate the balloon and securely remove it out. Stick some plastic spiders over the web! And there you go! The balloon spider web is ready! Freehand draw some skulls on your white paper or print some off of online clip art. Cut out a skull and glue it on the top of your paper. You will build your skeleton under this. Stick the ‘ribs’ first and then glue the spine over the top. Use a dot of glue on each end of the Q-Tip. Cut Q-Tips as needed for your skeleton’s fingers and feet. 5 Easy Art Projects For Toddlers! 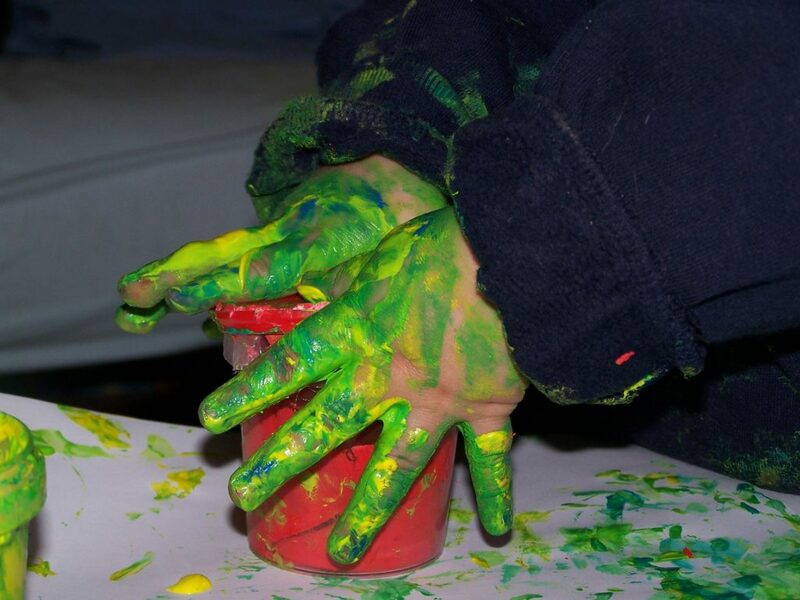 Children can be very artistic and very messy at the same time. 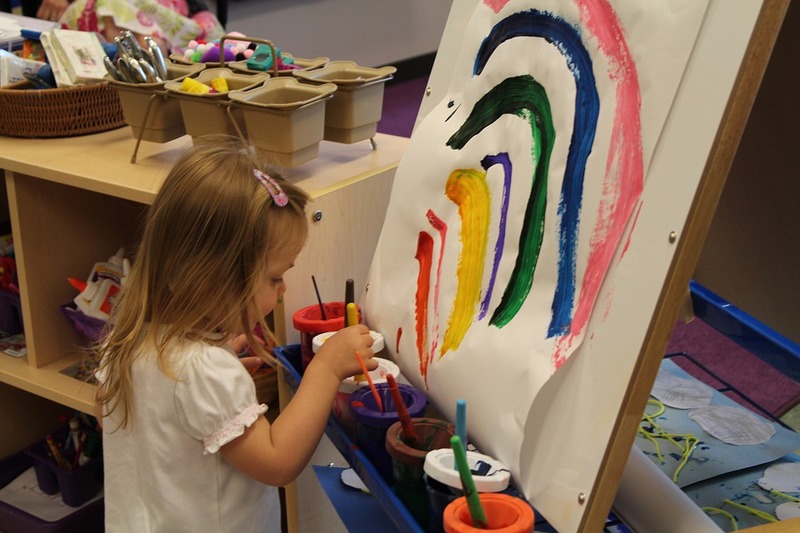 Creating art can enable them to explore various materials, colors etc. and think creatively at an early age. Toddler activities are slightly difficult to do because they are still learning and growing. 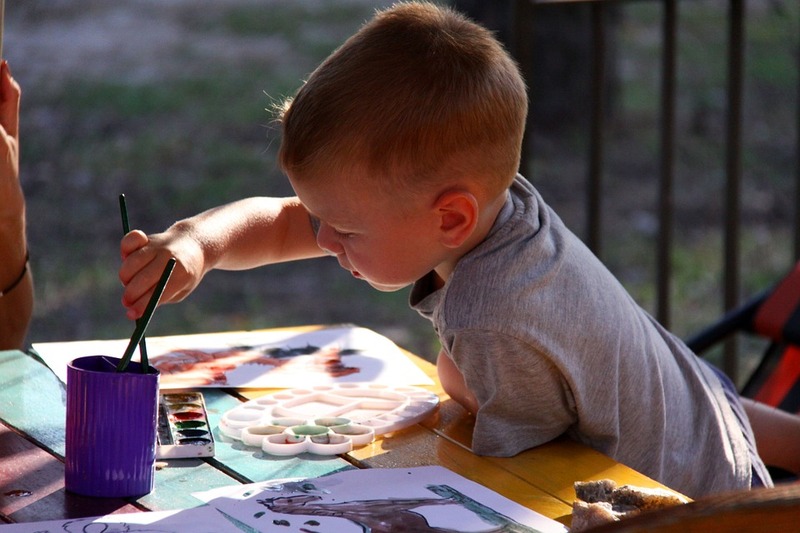 In order to enhance their fine motor skills, you can introduce some simple art activities so that your little one is engrossed and entertained for at least a few hours! As a parent, you must remember that your toddler has a short attention span and he might not even complete the art project. That is totally fine! Make it interesting for your child by avoiding repetition and by introducing new things every time. 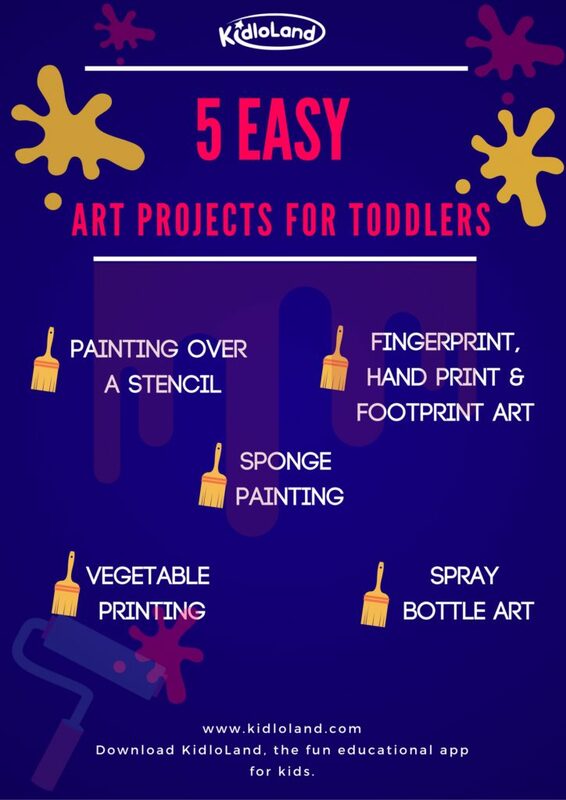 To help you do that, we have 5 simple and easy art projects that any toddler can successfully do! First, spread a newspaper on the area which might get messy. Find a large sheet of white paper and put it on the table or on the floor. Place a stencil sheet which has simple cut-outs to paint over. Give your toddler a big brush to dip in homemade edible paint just in case your toddler decides to eat it too. Here’s one way to make edible paint. That’s it! 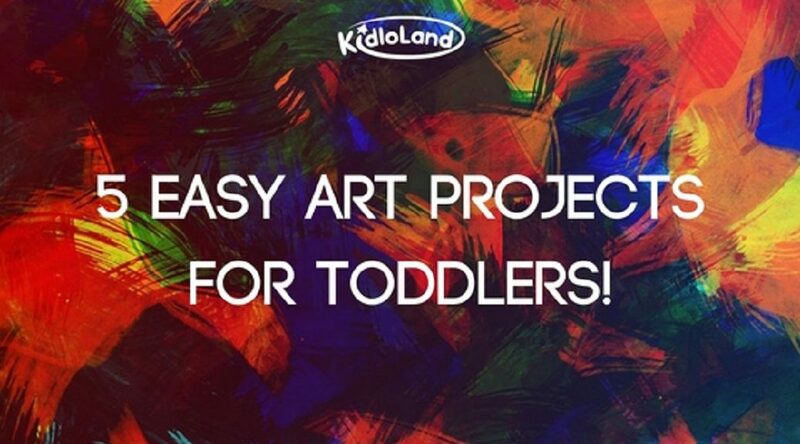 Let your toddler paint to his heart’s content! Sponge painting can be super exciting for little kids. Let your toddler dip one side of these sponges in edible paint and stamp it on a fresh white sheet of paper or plain cloth. For this art project, you can draw a tree trunk with branches on a paper with a black marker. Once that dries, ask your child to dip her fingertips in edible paint and stamp it on the branches to imitate leaves. You can also get your toddler to make fingerprints, handprints and footprints on the paper. After it dries, you can draw funny shapes and smileys on those prints together! This makes for a beautiful piece of artwork worthy of being framed! Slice a few firm vegetables like carrots, potatoes, celery stalks, okra in different ways and allow your toddler to dip their ends in the paint. This will create beautiful prints which look like flowers! Finish off the artwork by painting the stems of the flowers yourself. Ta-da! Now you have a joint effort by you and your little one! Spray bottles can be an object of intrigue for toddlers and they won’t stop playing with it! To make spray bottle art, fill a spray bottle with edible or non-toxic colors mixed with a little water. Keep a towel on the floor that can absorb the paint that will drip down. Place a large paper on a stand. That’s pretty much it. 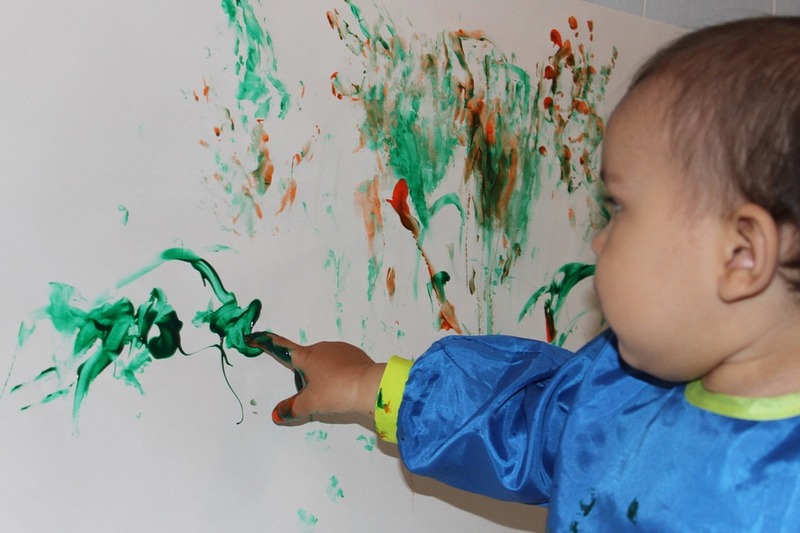 The next step is to let your child spray the watery paint on the paper and create his very own abstract art! Soon, it will start snowing and in a couple of months, Christmas will be here! Kids everywhere absolutely love playing in the snow while parents do not look forward to shoveling their driveway. Some people get excited for winter while some detest it. Well, you don’t have to be glum just because there’s hardly any sunshine. You can still make the best of it by participating in fun winter activities with your family. 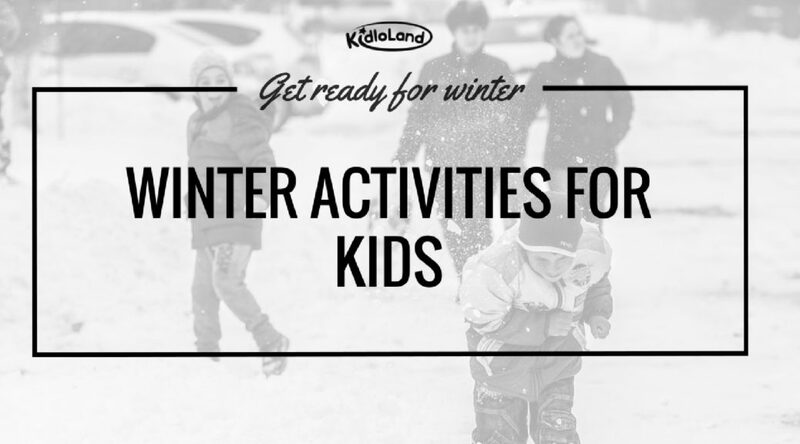 Here are 10 awesome winter activities that you can enjoy with your kids! A snow skiing getaway can be a great experience for the whole family. Kids can easily learn to ski with a good instructor and some practice! After you make sure that the snow doesn’t have shards of ice or stones in it, you can make small snowballs and have a snowball fight! This is a great way to relax, relieve stress and have fun with your children. Shoveling snow can be a dreadful experience if you’re doing it alone. On the other hand, your kids will be excited to shovel snow with you! Get your kids their own kid’s snow shovels and shovel snow together. This can be very helpful to keep them physically active during winter. Get dressed in appropriate (layered) winter fishing gear, find a good spot and relax. Winter lowers the metabolism of fish and hence, they’ll feed more if the bait is small. If you’ve never gone fishing with your child, this can be a brand new experience. Stay safe and have a great time. 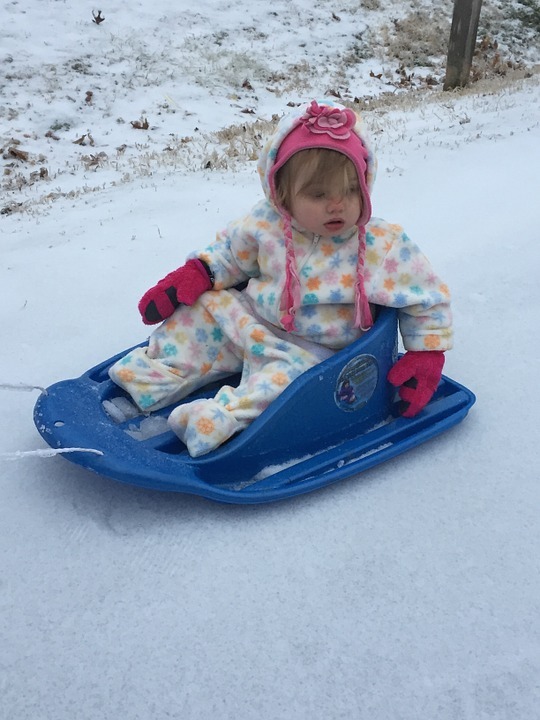 Sledding is an exciting recreational winter activity enjoyed by kids and adults alike. Revel in the breathtaking views of snow-capped hills and enjoy sledding down the slope! What is winter without some ice skating? 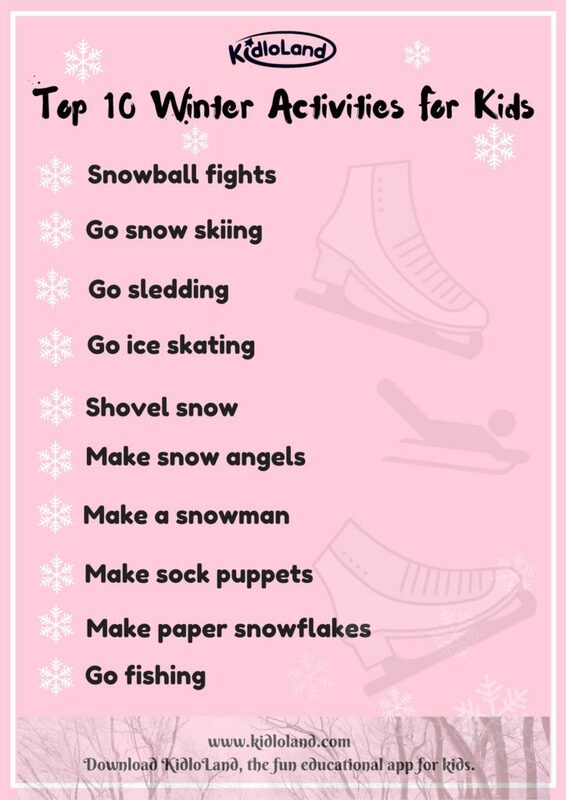 Going ice skating is a must-do activity in winter. Experience the cold breeze of a crisp morning and have fun gliding on the ice. 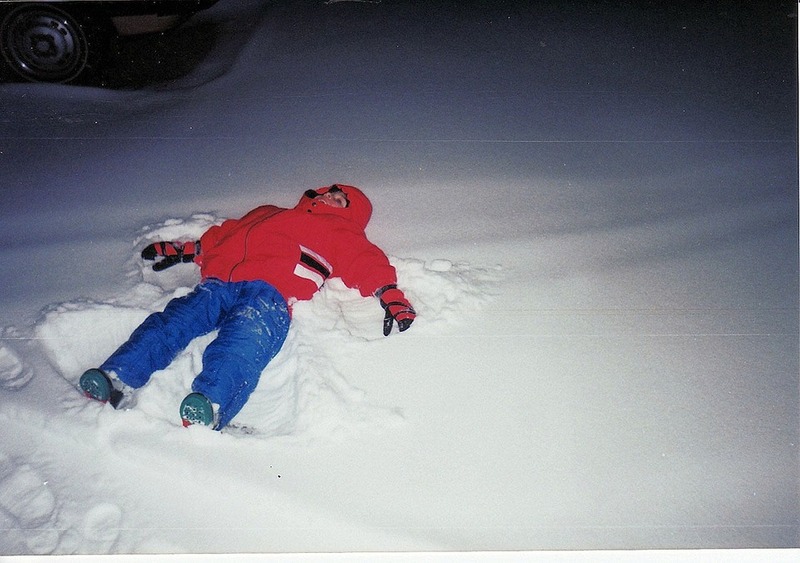 If you ask your kids to make snow angels in the snow, they will happily oblige! Don’t forget to capture these beautiful moments on camera! The next logical step after making a snow angel is to make a snowman! Find a good place with lots of snow, make snowballs for the snowman’s body and get creative with the accessories! Staying indoors in winter can also be interesting for kids. Making sock puppets is simple and easy, you can watch this tutorial video to know more. Attach googly eyes and some fabric to complete your very own unique sock puppet! This winter art & craft activity only needs two things – paper and scissors (Side note for parents – make sure you do all the cutting). Every design you create and cut will be different, just like a special snowflake! Here’s a great guide to find out how to make beautiful paper snowflakes. Halloween is right around the corner! 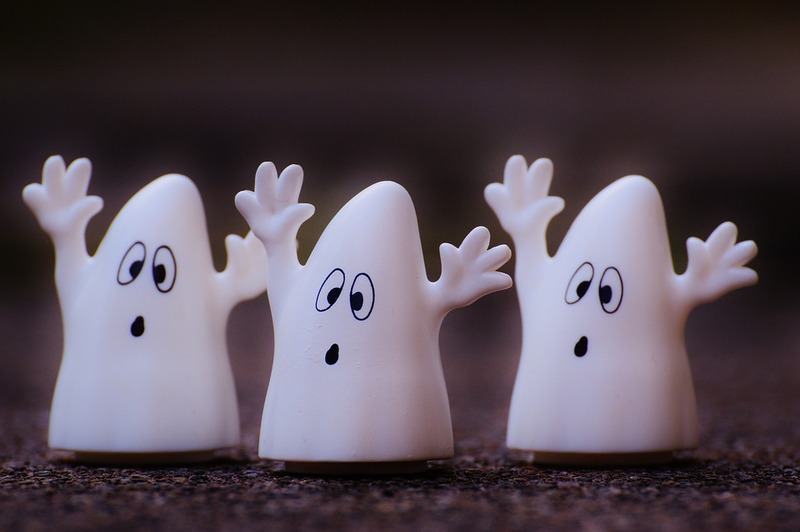 It’s that time of the year when your entire family dresses up in quirky outfits and wears crazy make-up – the spookier the better! 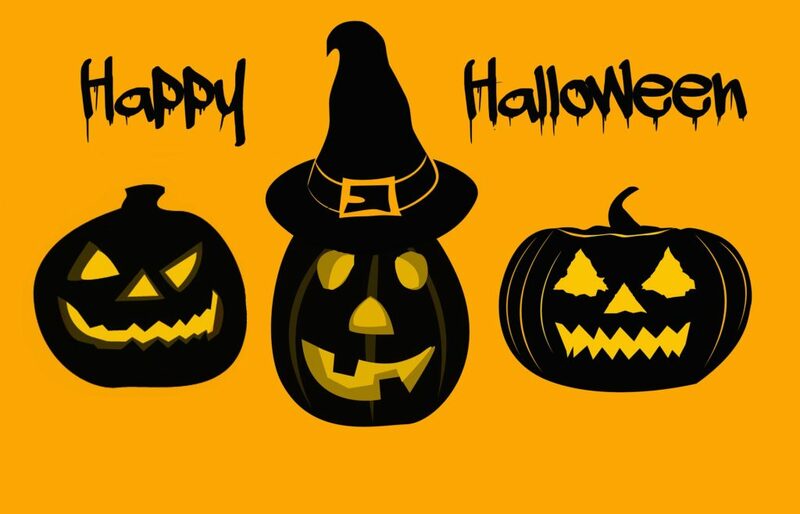 Halloween is filled with great activities like costume parties, carving jack-o’-lanterns, putting up spooky decorations, trick or treating and so much more. Every parent loves to team up with their child and become the center of attention of every Halloween party. It’s a great experience for you to bond with your child and create memories that you can treasure for the rest of your life. If you’re not sure of what you and your kid want to dress up as for Halloween this year, don’t worry! Here are 7 easy and awesome Halloween costume ideas for you and your little one! ‘The Tortoise and the Hare’ is one of the most famous Aesop’s Fables. For the tortoise costume, you can dress your munchkin in a green colored outfit. Get him a backpack shaped like a tortoise shell and you have a cute little tortoise! You can dress yourself in a brown outfit and add bunny ears to go with it. If you have a daughter, she’s most probably obsessed with the Disney movie ‘Frozen’. Halloween is the perfect occasion to team up with your daughter as Disney princesses. 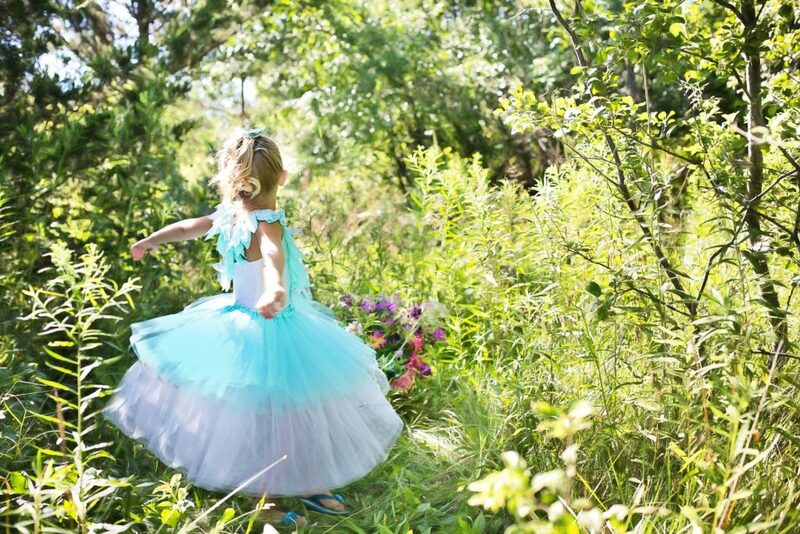 You can let your daughter be either Anna, Elsa (or even Olaf!) depending on her choice, and you can be the other Disney princess. And don’t worry, Dads can dress up as princesses too! ‘The Addams Family’ has been an integral part of our childhood. You can take a trip down memory lane by dressing yourself as either Morticia (the mom) or Gomez (the dad). Your daughter can be Wednesday Addams or your son can be Pugsley Addams. This is also a great family Halloween costume idea! Both famous characters are a part of ‘101 dalmatians’. Your toddler can dress up in an adorable dalmatian costume. As Cruella De Vil, you can wear a long black dress and temporarily dye half of your hair silver or wear a wig! 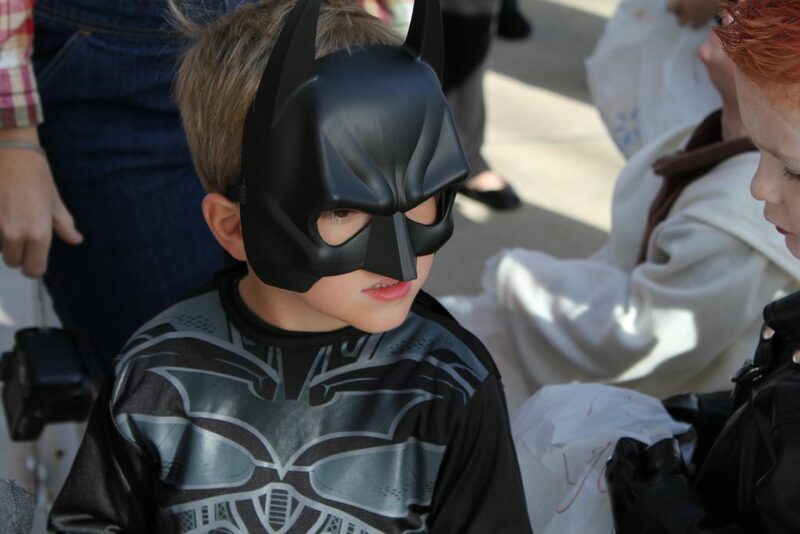 Spice up your Halloween by being the Robin to your child’s Batman! Find an awesome Robin costume for yourself online and a tiny Batman costume for your little superhero! What fun it will be to be your son’s sidekick! Mickey and Minnie Mouse ears are extremely easy to find. Grab a pair of those ears, add short red pants with two buttons for the Mickey Mouse costume and a polka dotted red skirt for the Minnie Mouse costume. That’s it! Easy as pie! Dress up as a Starbucks employee by wearing a black shirt and black pants with a green apron. Stick the Starbucks logo on it. For your child, you can make the cold coffee outfit yourself – just take a big cylindrical cardboard roll, print the Starbucks logo and stick it on the cardboard. Add ruffled white fabric to imitate foam, add a green straw made by cardboard, and voila! Your cold coffee is ready! 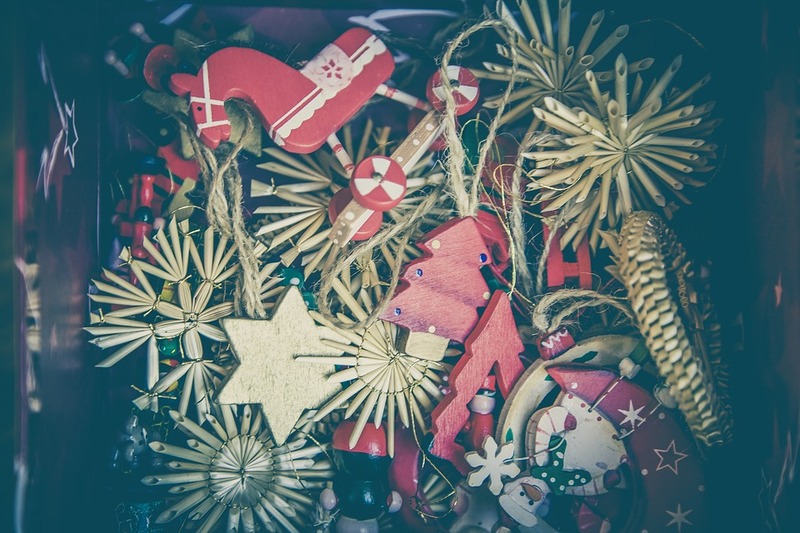 Let’s get crafty this Christmas! Encourage creativity, keep little hands busy and enjoy your holidays all while making fun crafts! Looking for some fun craft activities to keep your little ones busy during the Christmas holidays? 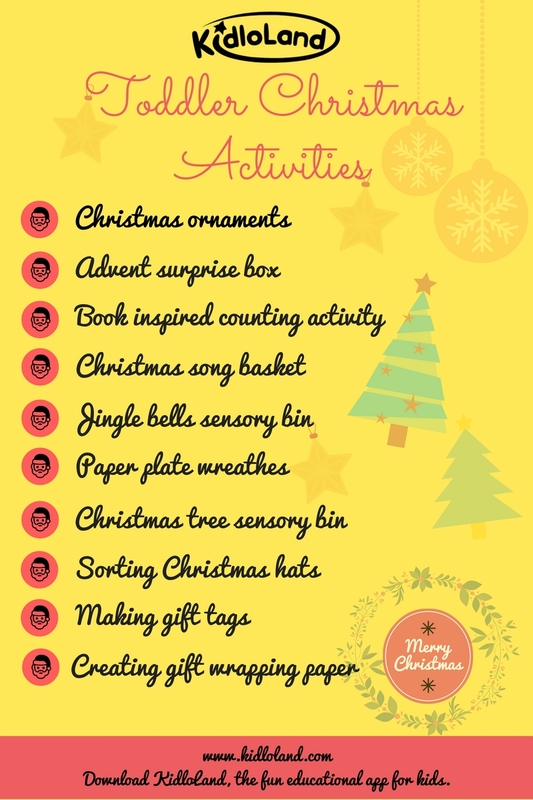 Here are some fun-filled and amazing Christmas activities for toddlers! There’s nothing more fun than a special Christmas craft just for toddlers. This cute toddler advent surprise box will create cherished memories as your toddlers grow! Each morning during the countdown to Christmas, your toddler will find a special treat, craft, or activity in the box they painted on the first day of the countdown. The cute chalkboard tag makes it easy for you to change the date as you and your toddler countdown to Christmas day! When it comes to Christmas activities for toddlers, the toddler made Christmas decorations are one of my favorites. They are really simple to make, and they look fantastic. We hang some of them on our tree and wrap up a few as presents too! Read any storybook! Put together a basket of tangible objects to represent each page of the book. Then count them together with your toddler! In this activity, you will have to fill your bin with paper shred. Hide the jingle bells making sure to count how many you hide. Instruct your child to find the all the bells. I added a cup for their found bells. This is a great sensory experience as they will feel the texture of the paper shred, hear it crunch and hear the bells jingle. With Christmas so close, toddler made paper plate wreathes would be a fun place to start! Grab some stickers or Christmas stamps to get the wreathes decorated! Put a layer of cotton balls on the bottom of a plastic container. Cut the tree branches or garland into pieces that are about 4 inches long and place the pieces on top of the cotton balls. Add the tinsel, jingle bells, and plastic bulb ornaments. Sensory Bins are always fun, tactile sensory activities for kids. Your children are sure to love exploring the parts of a Christmas tree in this Christmas tree sensory bin. First, cut three sizes of red triangles. I cut 4 of each. Add strips and white and pompoms to resemble Christmas hats. Add it to the tray, mixed up. Give the instruction to sort the hats by showing your child the different sizes. Place one of each size in each space provided for your child to copy. Let your child sort and count the hats too! There are so many Christmas songs for kids and you only get the chance to sing them for about one month a year! A fun way to teach the kids some new songs and have fun singing together would be to make a Christmas song basket. Then let toddler take turns choosing one of the Christmas props out of the basket and start singing! 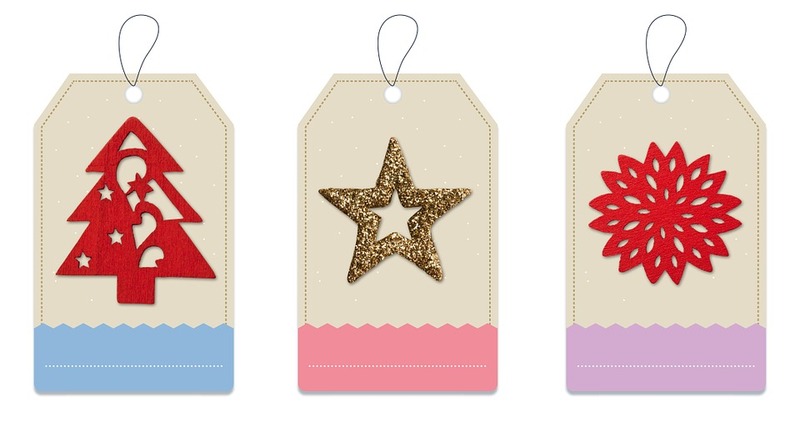 Arrange a selection of the Christmas stickers, hand out the cards and let them stick the stickers wherever they like. For the younger toddlers try to use bigger stickers. Use the raised foam stickers as they are easier for little fingers! Christmas holidays are coming! Playing Christmas games with your children is one of the best ways for celebrating the holiday season as they not only supply entertainment but also help your child in sensory development and learning new things. Keep your children learning as they celebrate the merriest holiday of the year with Christmas Party Games! In this game, all you have to do is cut a large bell shape out of a large piece of cardboard. Then attach all the bells to a piece of ribbon. 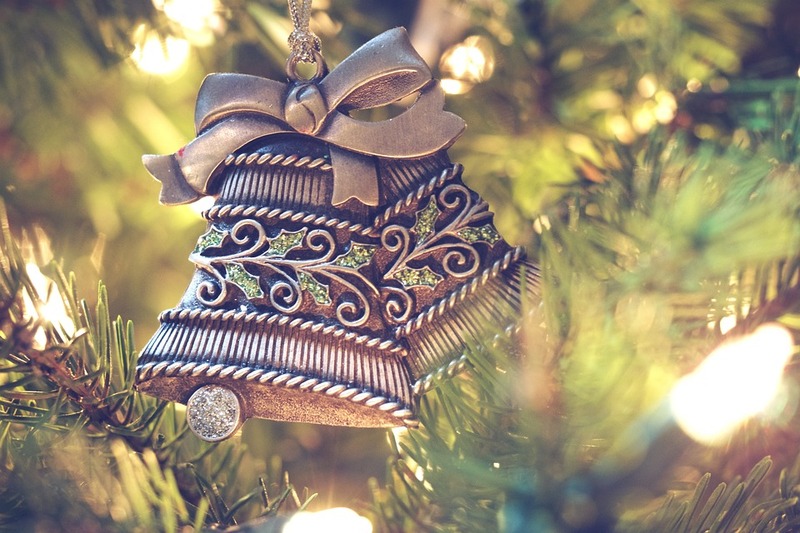 Then attach the ribbon to the top of the bell shape cutout and let your children ring the bell by throwing bean bags or balls through the hole. Play Christmas bingo with your children by making a bingo card with different Christmas shapes like Christmas Trees, Stockings, Reindeer, Fireplaces, Santa, Ornaments, etc. on it. Next make Rudolph Nose markers (red circles). Have your children cover the shape you call or hold up larger pictures of them. In this game you call out big, medium, and little and tell your children to be that size of Christmas Tree. Little: Sit down with legs crossed and put hands above head in a point. Set different spots on your floor by using tape, paper bags, hula hoops, etc. and place different toys on each spot. Tell your kids that they need to test out new toys for them. Play music and tell the children that they have one song to play at an area and then once the music stops they have to move to the next area. Have all your children sit in a circle. Let them all pass something like candy, small toys, crayons, etc. around the circle (once they have one thing mastered you can have them pass two things – one clockwise and one counter-clockwise. Play music and when you stop the music the child that is holding the item gets to keep it and then give one to another child that has not yet received an item. Continue the game until everyone has an item. Tell all your children sit in a circle. 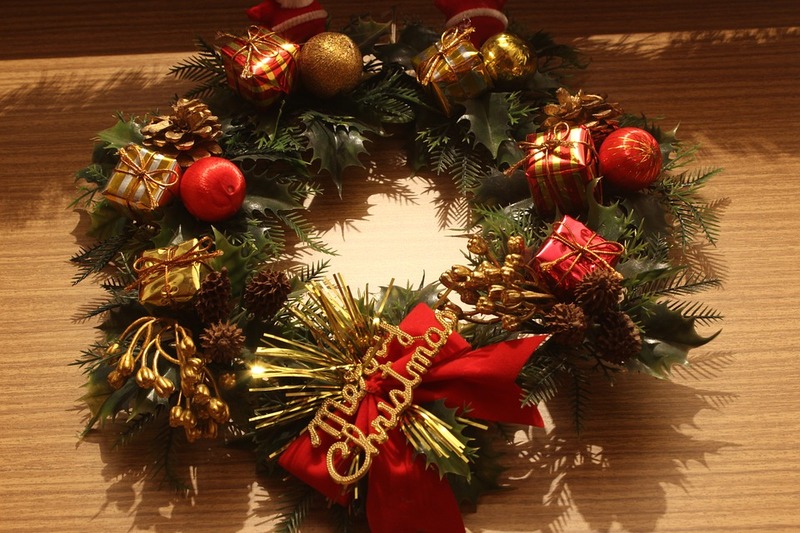 Let them all pass a plastic or a silk mistletoe around the circle. Play music and when you stop the music everyone blows kisses to the person holding the mistletoe. Make all kids sit in a circle. Choose the first picker from among the kids. The picker walks around the circle tapping heads of all kids by repeatedly saying “Santa”, finally chooses a kid by saying “reindeer” and runs. The kid who runs around the circle and sits down at the reindeer’s spot wins! Play many rounds to have fun! For this game you have to cut out Christmas Trees with felt. Next you have to cut out ornament shapes out of different colored felt. Let your children decorate the felt Christmas Trees. For older children tell them how many ornaments to put on the tree or have them roll dice to decide. To play this game, one person is chosen to be the Santa. All the children stand on the starting line and the Santa has his back to the rest of the children. When he says “green light,” children try to run to the finish line. When the Santa says “red light,” he turns around and children have to stop in their tracks. To have more fun provide dress up materials like elve hats, Santa hats, beards, boots, etc. 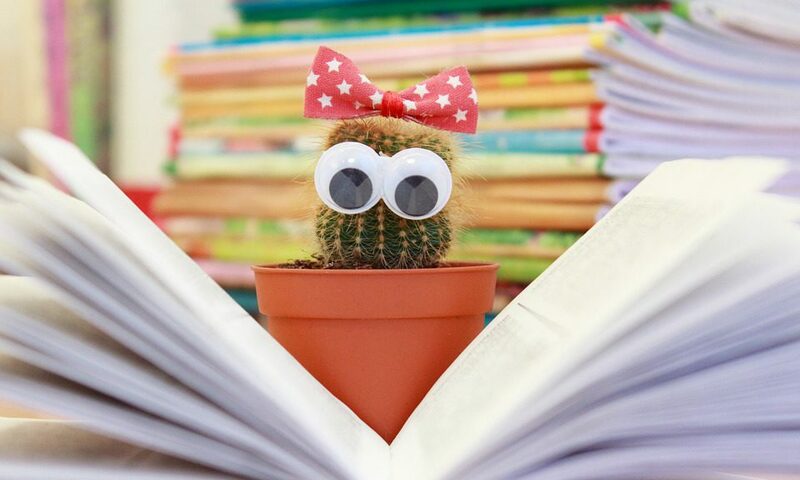 Put bows all throughout your classroom i.e. on the floors, chairs, etc. Play music and have your children run around without touching the bows! In this game you have to use a cookie cutter and draw different shapes on a large piece of felt. Use a knife to cut out the shapes. Let your children match the shape to the missing part of the felt. Produce several different Christmas Shape Cutouts (Santa, stocking, ornaments, Christmas Trees, etc). Cut them in half and then tell your children to match the halves. You need to draw and cut out a reindeer face with details like eyes, mouth, ears and atntlers. Hang it up and see how many children can pin his nose in place. 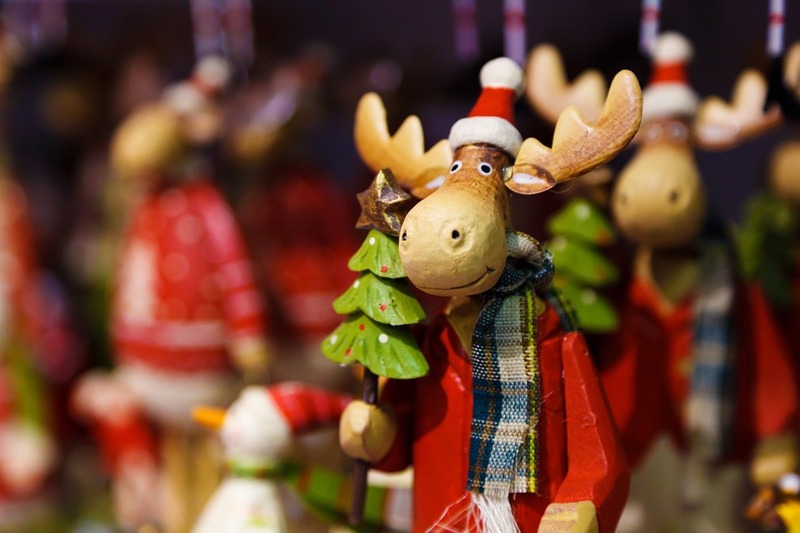 To make it extra challenging, spin each kid around before pinning the nose on the reindeer. Reading helps your child’s development. The child gets familiar with sounds, words, language, and print. All this adds to your child’s early literacy skills and helps him go on to read successfully later in life. It also stimulates your child’s imagination and helps them learn about the world! Reading together creates a precious time for bonding with your child. As children read, they learn new words and also as they absorb more and more information, they understand how to frame sentences properly and ways to use words and language effectively. Reading helps kids to learn new words and connect them to other words. Learning these new words helps to be more expressive. When kids read, their brains translate the descriptions that they are reading into pictures. When they are reading a story, they also imagine how the characters are feeling. They tend to relate their own experiences to the experiences of characters. 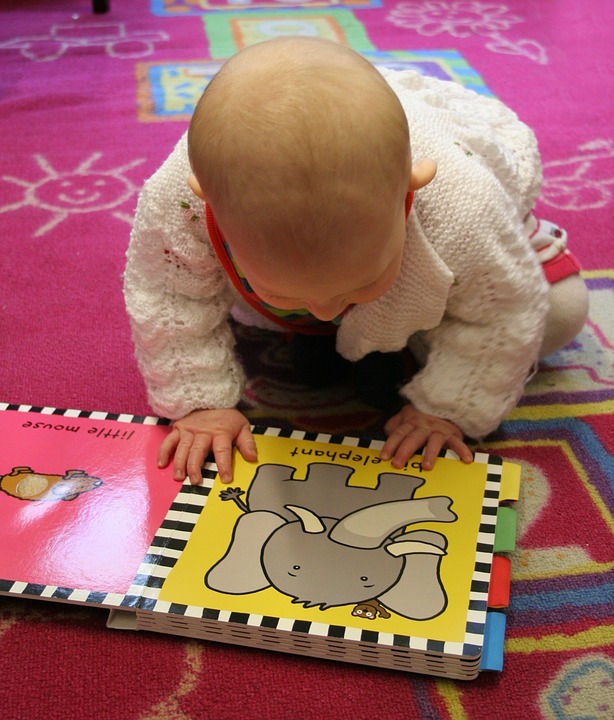 When you spend time reading to toddlers, they will try to express themselves and relate to others in a healthy way. 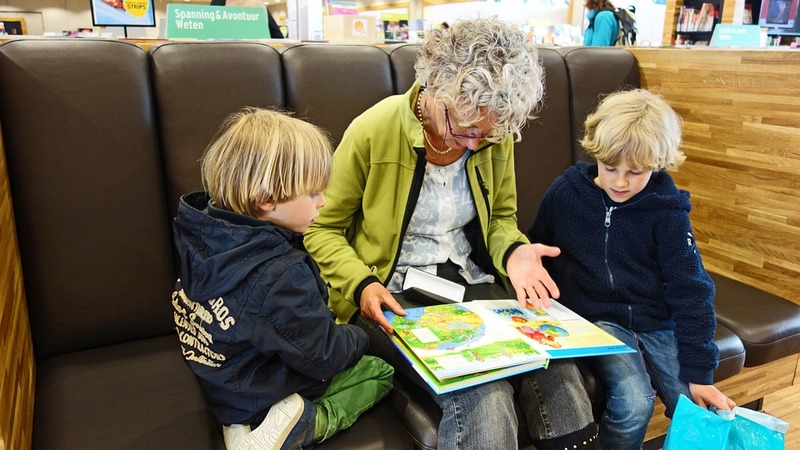 By witnessing the interactions between the characters in the books and the contact with your child during story telling, your child is gaining valuable communication skills. To cultivate reading, kids have to sit quietly at one place for long time periods so that they can focus on what they are reading. Reading regularly thus develops a concentration in them. Little readers grow a habit of asking “why?”, “what?” and “how?”! Reading helps them develop a sense of curiosity which eventually emerges into building up the knowledge base of your kids. When a child reads aloud, it forces him to read slower which gives him more time to process what he reads, which improves reading comprehension and helps in building up vocabulary and phonics skills. Reading and creativity go hand-in-hand. When kids read, they are taken into a completely new world which your brain learns to comprehend. This virtual reality created nurtures their brain to develop ideas for new worlds and other possibilities and also sparks their imagination. When we read, we read in silence. The constant blinking and flashing lights which attack our senses when we are watching TV or looking at a computer are actually stressful for our eyes and brains. Reading the black print on a white page is quite less stressful for the eyes and brains. Encourage children to read aloud. When you encourage kids to read aloud, it helps them to improve their pronunciation skills and be audible enough. Reading gives exposure to the unknown facts. This is the root cause of interrogation which leads to the thinking and questioning process and helps kids to discover new things. If you are looking for a nursery rhymes app for babies, try KidloLand! It has a huge collection of nursery rhymes for kids and lots of exciting original songs too. Download the app for free now!